This year, I took a gamble on two pies I had not previously made — Martha Stewart’s Poached-Pear and Cranberry Pie and a New England squash pie, made with canned squash from Maine (more on this pie in another blog entry). I saw Martha make the pear pie on an episode of her PBS show “Martha Bakes,” an endlessly fascinating (to any baker or not) and inspiring show. 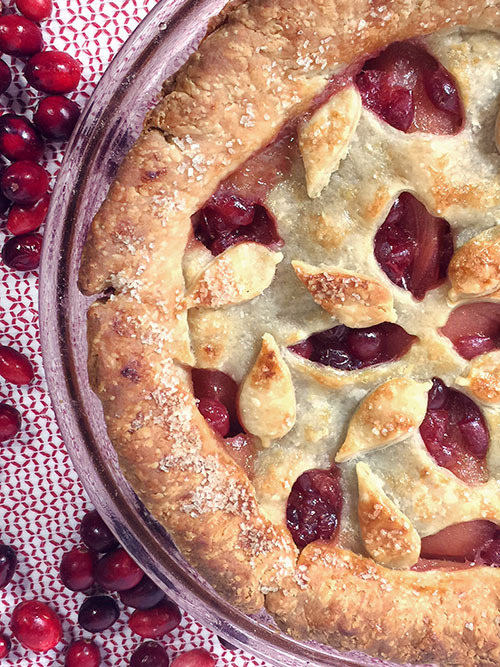 The pie, though multi-stepped (it require a poaching and cooling time for the fruit), was appealing, as it celebrated two of my favorite fall fruits — the under-sung pear (people really don’t make enough with pears) and the tart-y cranberry (of which people mostly make cranberry sauce or cranberry nut bread). The recipe began with pear selection, which was no problem, given the season. So many kinds of pears out in the markets now. 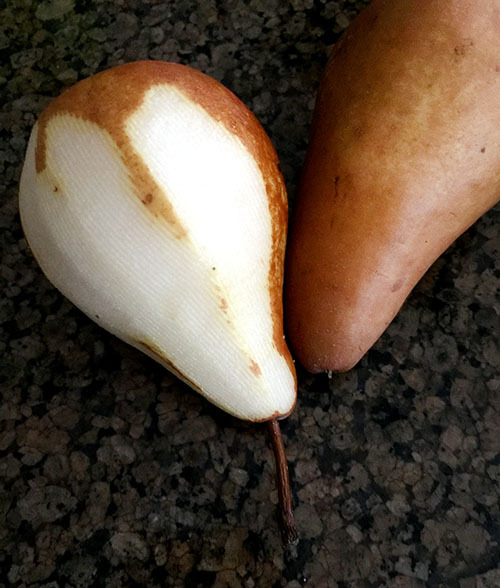 The recipe called for Bosc pears, which are both lovely and humble-looking in their golden brown skins. I chose some that were well-firm, knowing I wouldn’t make the pie for a few days and also considering the pears were to be poached..I didn’t want the fruit too ripe or soft. I went out on a limb and made a big modification to the recipe. 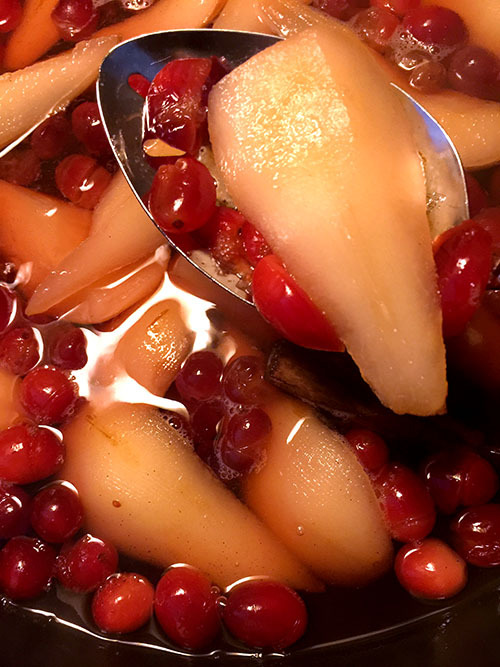 For Martha’s version, the pears and cranberries were to be poached in dry white wine. 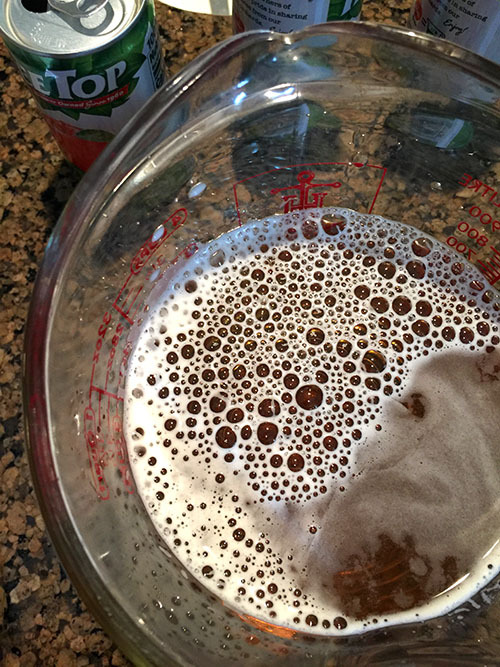 I decided to do an alcohol-free version and saw no reason (hopefully) that apple juice (with a splash of apple cider vinegar for some acid tang) wouldn’t be a flavorful substitution. The liquid is heated with some sugar (I used less than the recipe called for since the apple juice was sweet), a star anise, cinnamon sticks and some vanilla bean (I used one teaspoon of vanilla bean paste rather than the bean pod). 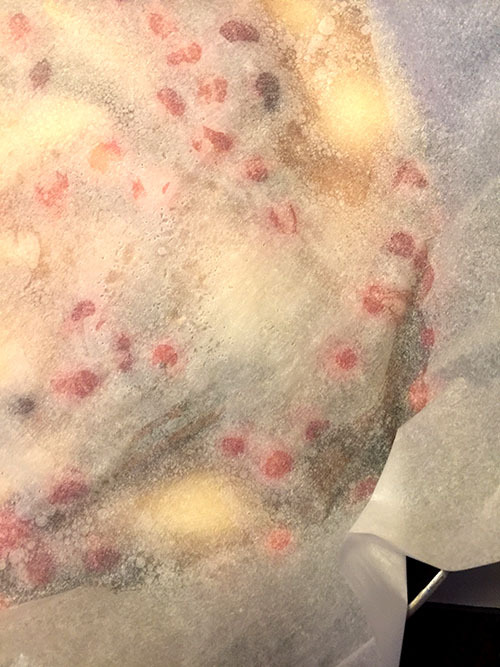 Once the liquid is boiling and the sugar dissolved, I added the peeled, cored and quartered pears, along with a little water to ensure the pears were immersed with liquid. Then I covered the pan with parchment to allow the poaching process to continue. After the pears were tender, I scooped all the fruit out with a slotted spoon, reduced the poaching liquid before adding it back into the fruit, then allowed everything to cool. I had made the buttery pie pastry (pate brisee) dough a day before. 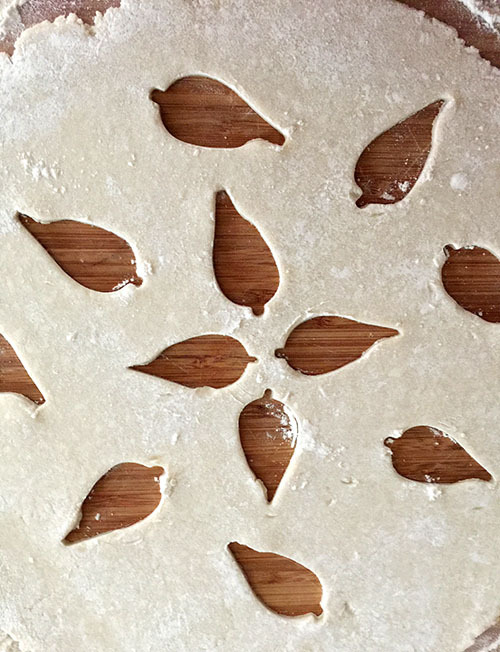 I previously made a similar version of the dough for some apple dumplings (see blog of 10/18). This dough is not only delicious, but is very nice to work with when rolling out and shaping. I lined my deep-dish crust with half the pastry dough. 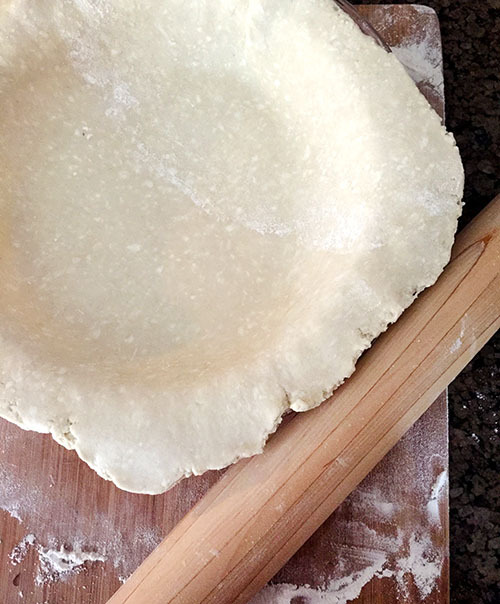 Here, I must mention that the online version of this recipe did not have this step included at all, but I went ahead with it, assuming that there was, of course, a bottom crust. 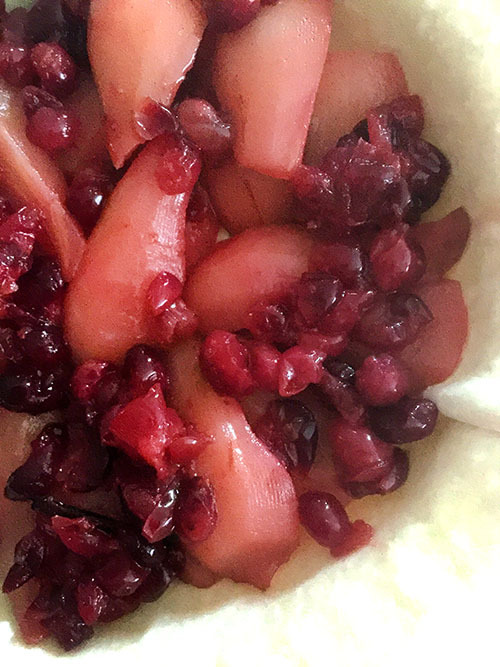 The steeped and cooled poached pears and cranberries were again scooped out of the liquid and blotted a bit so that they did not add too much moisture into the pie. 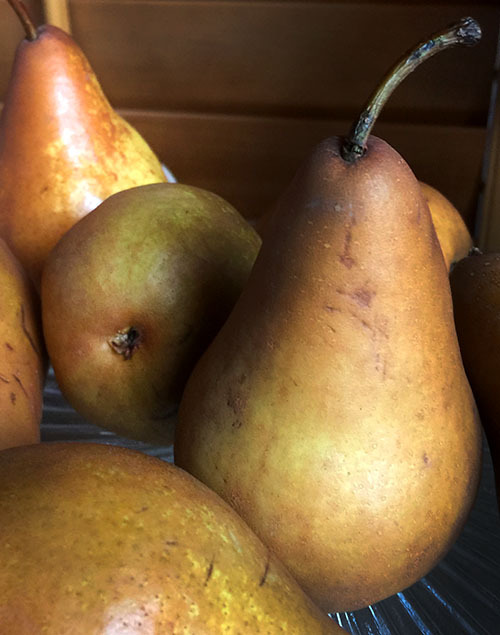 The pears had taken on some of the cranberry color, so the filling was a lovely reddish-pink. 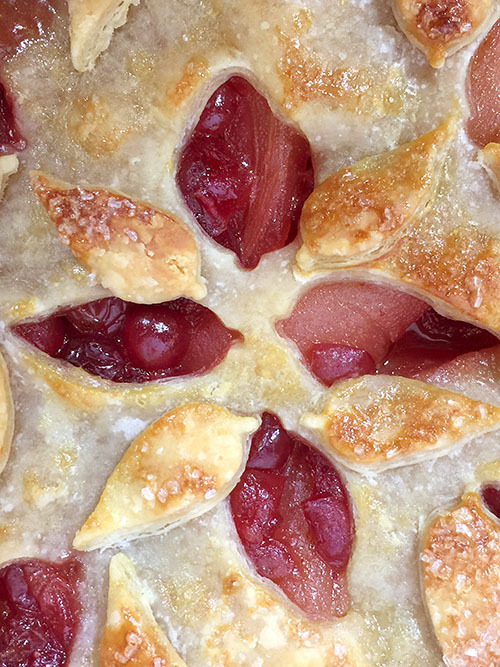 Martha’s version of the recipe has a top crust with pear-shaped cutouts all over it…I did something somewhat similar, using a little leaf cutter in a random scattering across the surface. With the aid of egg wash (which also sealed the top and bottom crusts together), I applied the reserved pastry leaves, then brushed more wash all over the top of the pie and added a sprinkling of sparkling sanding sugar to finish. When about to bake the pie, I discovered some instructions — the starting oven temp — also missing from the recipe. Since the pie was to be turned down to 375 degrees after the first 20 minutes, I went with some previous pie recipes I’d known to start at higher temps and began my baking at 425. The pie browned up beautifully in the oven (I did tent it toward the end of the cooking time so it would not get too dark). 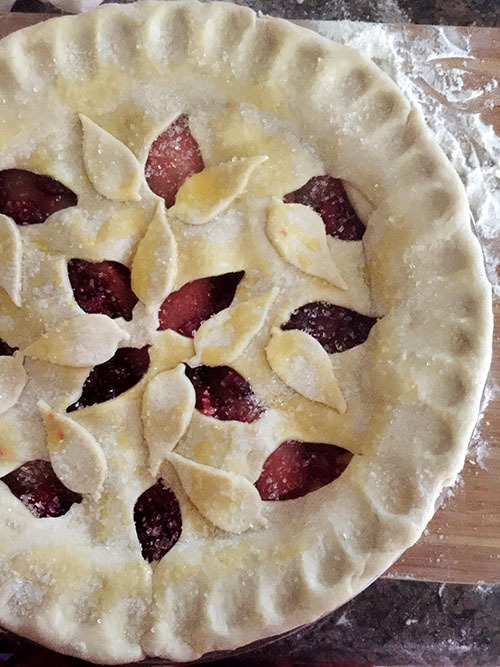 My little designs on the pie crust did seem to morph a little bit, but the pie was still very pretty, and smelled so wonderful, rich with fruity spice. I’m not sure what this pie would taste like if the wine had been used, but the apple juice substitution really worked. 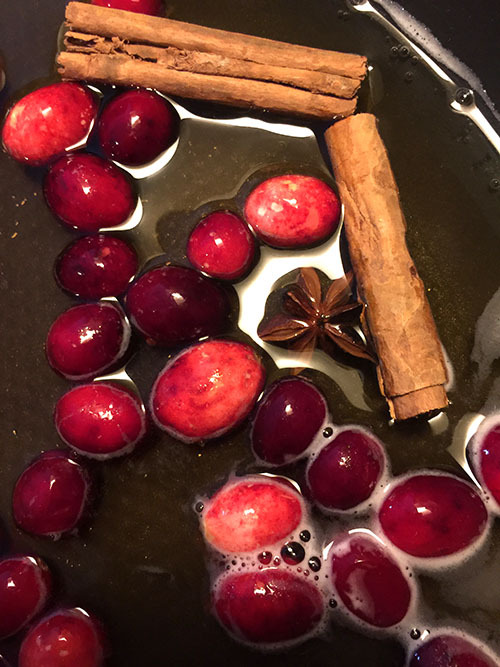 The pears and cranberries were infused delightfully with the fruit juice and also the blend of vanilla and spices, and the fruit took on an almost slight cherry flavor. With that yummy buttery pie pastry, it was a really wonderful pie, an excellent choice to try for the holidays. water, a little at a time. Do not process more than 30 seconds. cream). 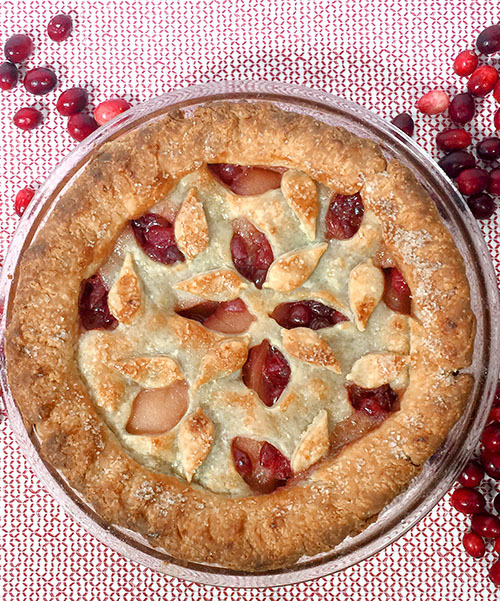 Arrange pears in prepared pie dish, then add cranberries. petal cutouts, re-rolling scraps to cut out more shapes as needed. Brush entire surface with egg wash and sprinkle with sanding sugar. 45 to 60 minutes. Transfer to a wire rack and let cool completely.